Architects: Tom Doak and Jim Urbina, with Karl Olson, Bradley Klein and George Bahto consulting. Cost: $220 for 1st round of Day at Resort, $110 for 2nd, $0 for 3rd (rates lower in off season). Caddies are available for $55 plus tip. 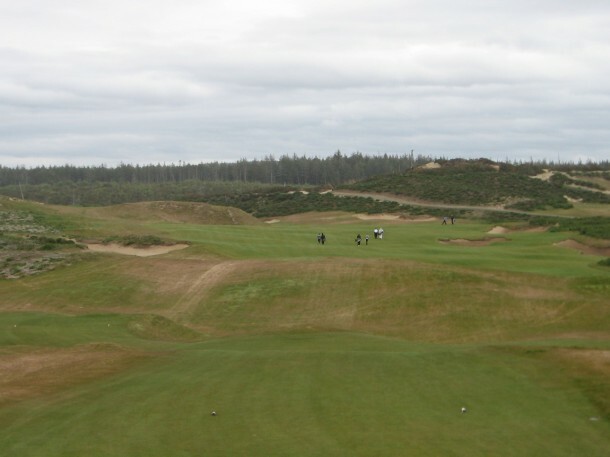 Old Macdonald, the fourth course at Bandon Dunes, opened for play on June 1st, 2010. I had the pleasure of teeing it at Old Mac on opening day, playing a total of 39 holes, and it was easily the most fun I have ever had on a golf course. I had thoroughly enjoyed the preview round and the full eighteen was, umm, eight holes better. There are a mix of photos from the preview round and opening day below. Old Macdonald is a tribute to C.B. Macdonald, who many consider the father of modern golf in the United States. 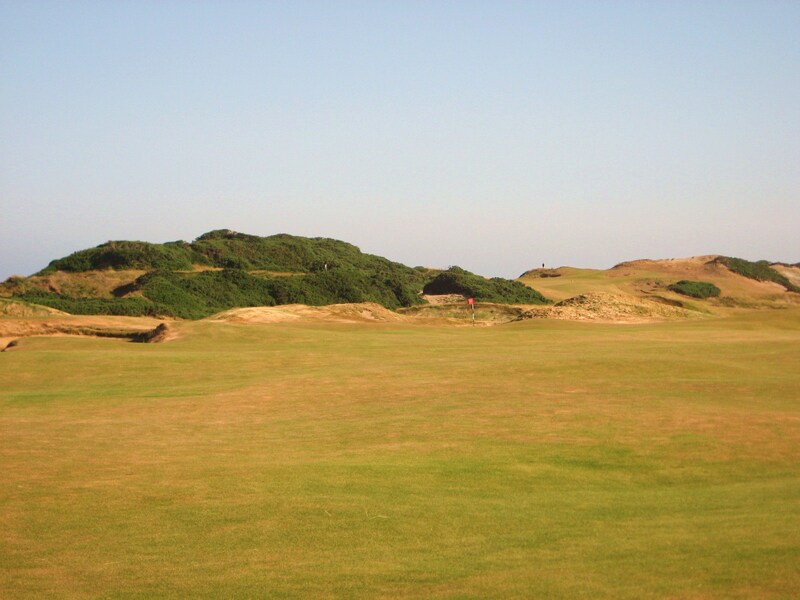 In order to bring the “highest caliber” of golf to the shores of America, Macdonald traveled across Great Britain and played many of its renowned links courses. 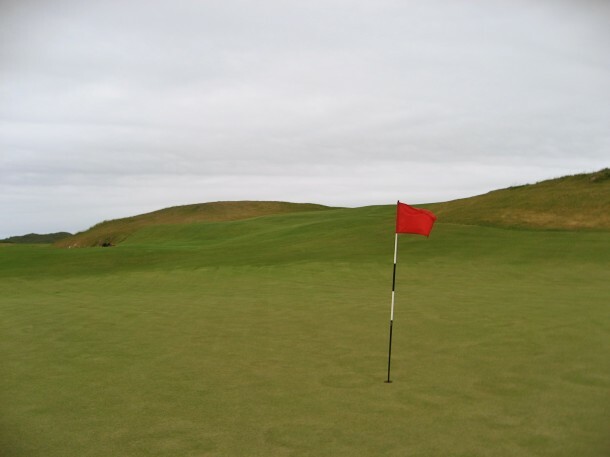 On his own course designs, such as The National Golf Links of America on Long Island which opened in 1910, Macdonald used “hole templates” such as the Redan, Short and Alps that he found on courses in England and Scotland. 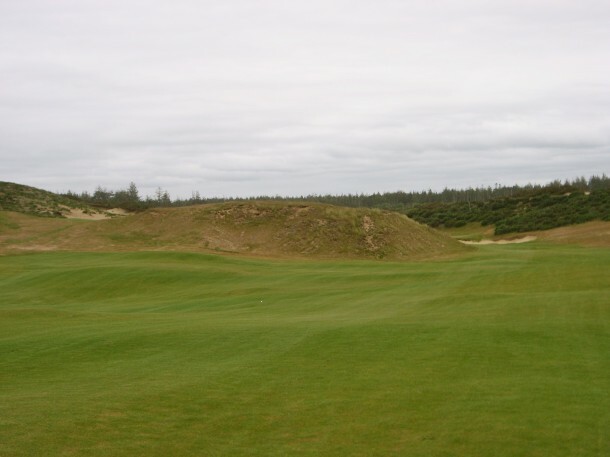 The course that Tom Doak and Jim Urbina have designed at Bandon Dunes, at the direction of Mike Keiser, has incorporated the spirit of many of Macdonald’s template holes into a spectacular routing which borders Pacific Dunes towards the northern end of the property. Karl Olson, former super at NGLA, Bradley Klein, long-time architecture focused writer for Golfweek, and George Bahto, author of the C.B. Macdonald biography “The Evangelist of Golf”, have also worked with the Renaissance Team to ensure that Old Macdonald adheres to the spirit and passion of the man it is built to honor. 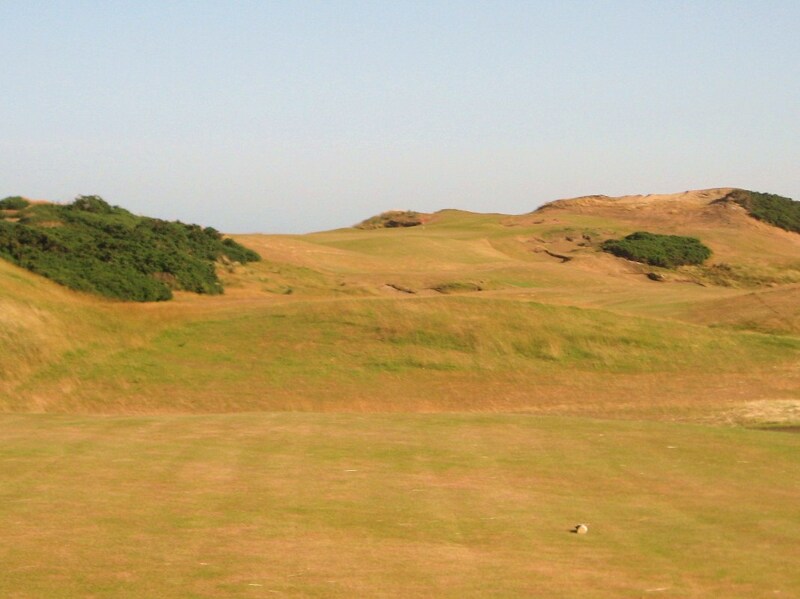 Old Macdonald is a wonderful golfing experience and very reminiscent of links golf on the coast of Scotland as the course is quite open, has wide playing corridors, is subject to wind, and calls upon the golfer for creativity in shot making. The course is walkable, with several ascents but mostly flat to rolling terrain. 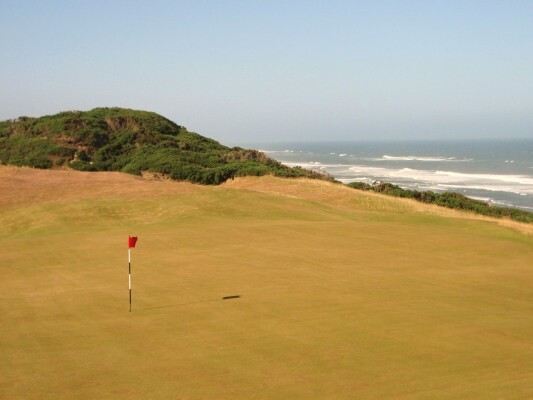 The scenery, which includes blow out bunkers, ocean views and some amazing tree specimens, contributes even further to what is already an “all world” round of golf. 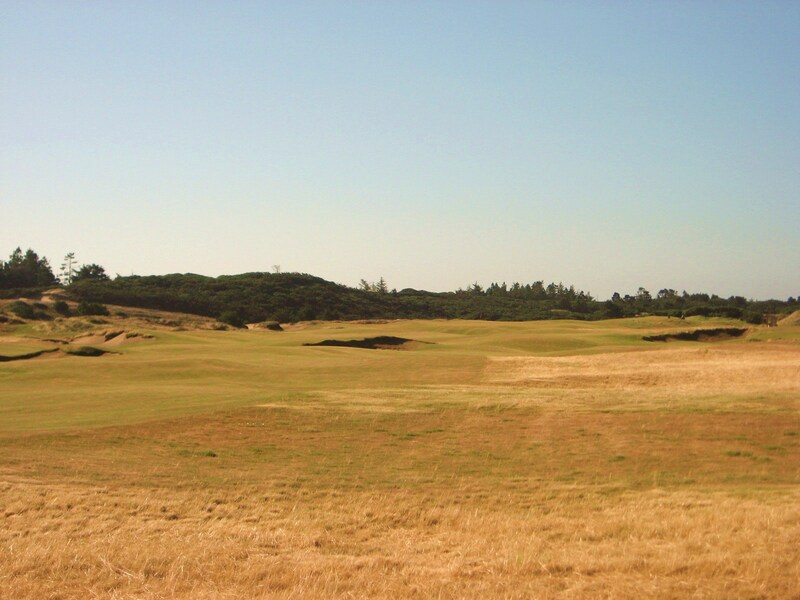 I would not be surprised if Old Macdonald becomes a favorite of many golfers who travel to Bandon Dunes. The opening hole at Old Mac is a nice introduction to the round as the golfer is greeted with a wide fairway and rather accepting green. 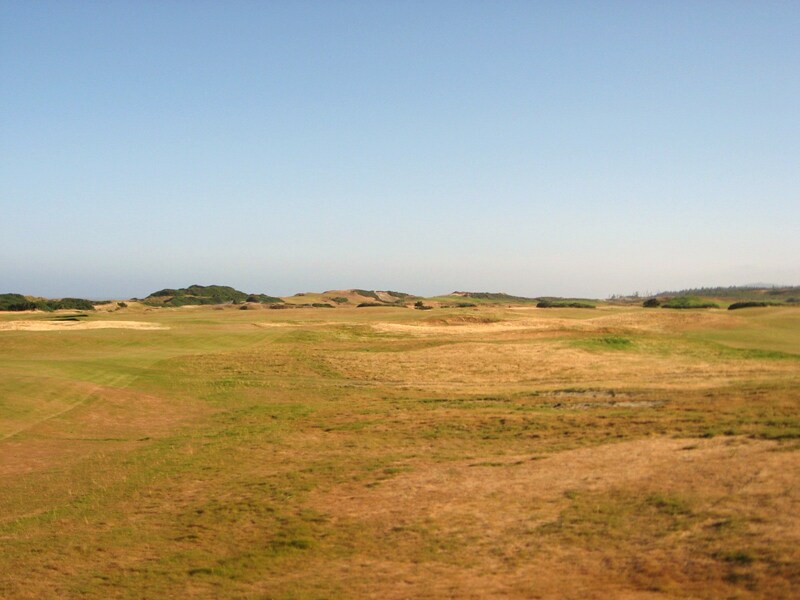 As you gaze across the landscape from the first tee it feels like you are playing a course that has been around for many years, with edges roughed by nature over time. Eden is a short to medium length one shotter depending on the wind and pin position. 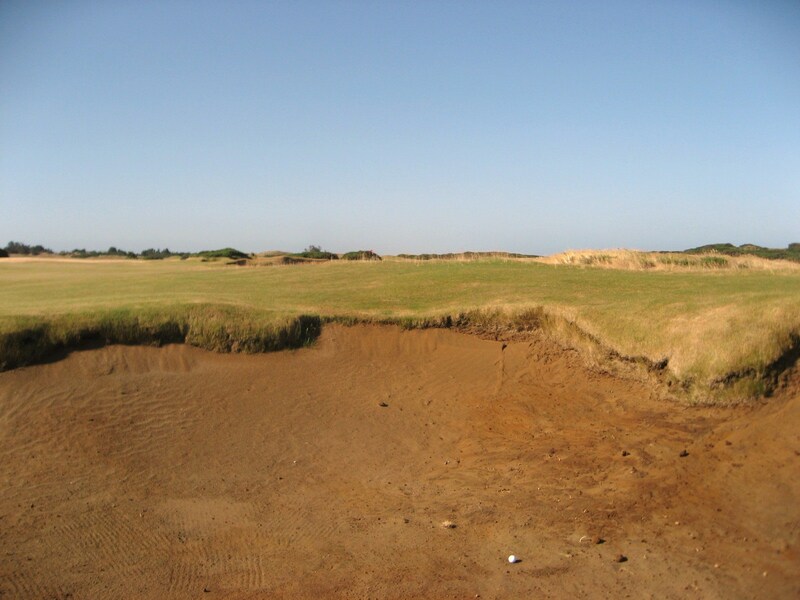 The revetted bunker front right is probably the most challenging to play from on the course, but rather fun to go in (especially if you make an up and down). The green is about 38 yards deep and runs front to back in three tiers. As you can see in the photos at the top of the post, the Sahara bunker is a beauty. 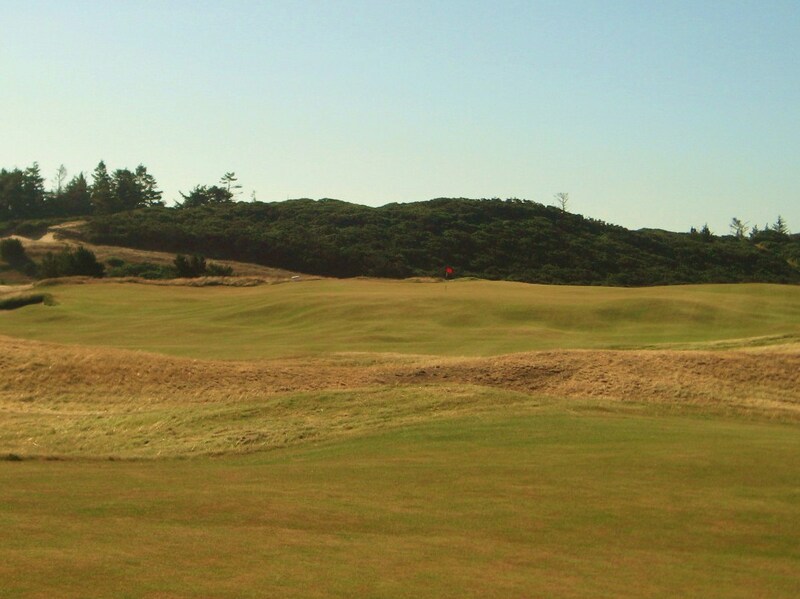 The third tee lies just off the back of the Eden green and the golfer is tasked to strike his ball up over a 40 ft ridge to the left of the bunker. The ideal ball flight is just right of the snare tree and down to the sloping fairway. 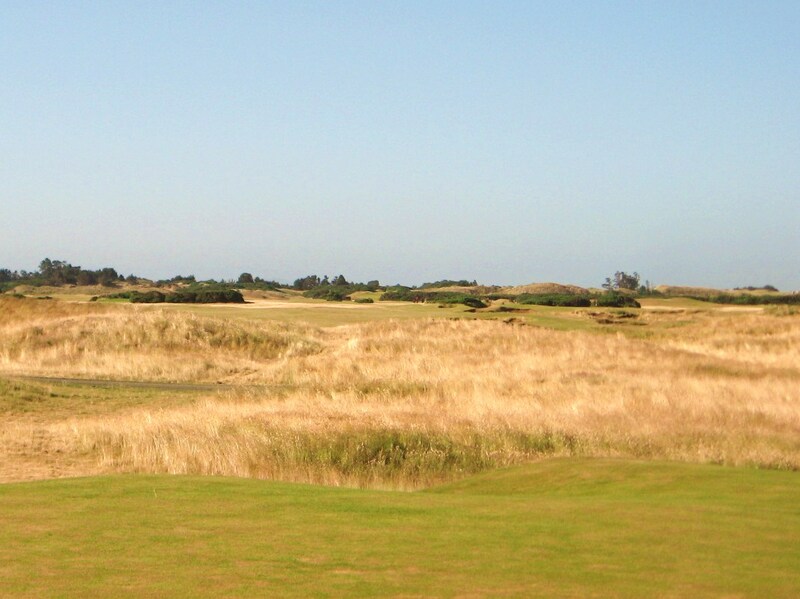 The dune that this hole runs across is spectacular, with long grass, sand, gorse and old trees creating a fascinating landscape. The large green is sunk into a little bowl with side and back boards to help keep the ball on the putting surface. The tees for “Hogback” are just behind the green in the short grass, a very linksy touch. “Hogsback” is a long two shotter that can easily turn into a three shotter if the drive is not pured and appropriately placed on the left side of the large spine that runs along the length of the hole. This a fun tee shot and the reward for crushing one is a long walk between drive and approach. 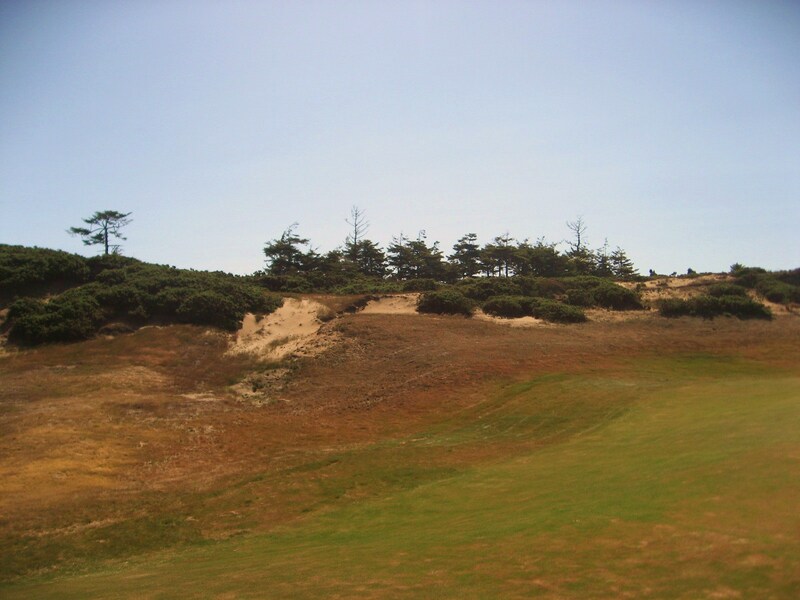 I played this hole with the wind during the summer and recall going driver, 9 iron. On opening day we played against the winter wind, although it was June, and I went driver, driver off the deck, and then putter from 50 yards. 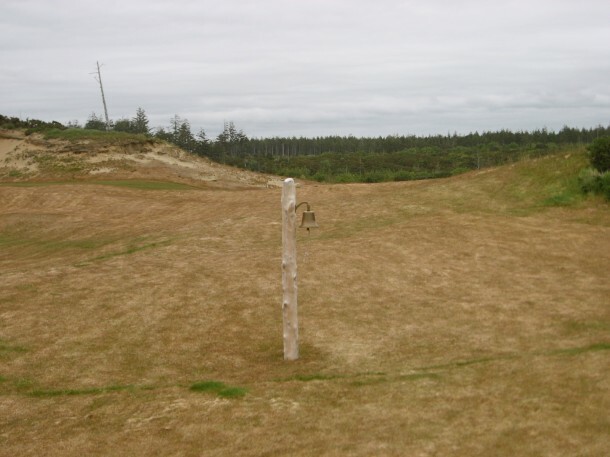 The natural beauty of the site at Old Macdonald is staggering as is evident in the photo below. Blow Out bunkers on "Hogsback"
Both of these drives took advantage of the slope and were over three hundred yards. The approach is challenging as a deep swale runs across the front of the green which means any shot that lands short, which is a necessity with a tailwind, needs to land in the trough or upslope to kick onto the green without running over. 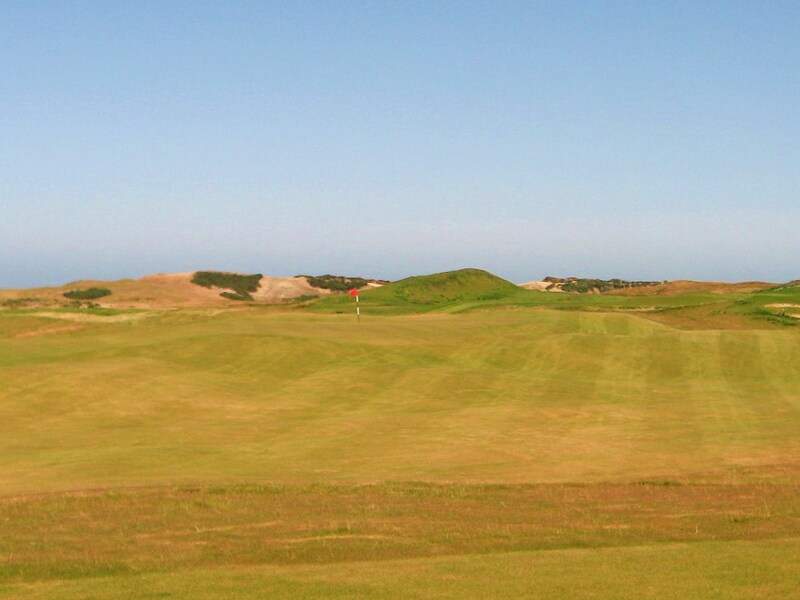 The wind is just ripping at the flag below, links golf at its best. The swale will catch any approach that lands too short and an uphill chip creates a difficult up and down. Swale guarding the Green on "Hogsback"
While the green may look large and flat, there is a mix of undulations that must be taken into consideration while putting. Once again, the greenside bunkering looks like it has been there for years. The round continues with an entertaining one shotter across a little valley to a mammoth double green that slopes severely, in levels, from back to front. The green is surrounded on the sides by huge bunkers that should be avoided at all costs. While the green is massive , it can be difficult to find the proper level, especially in strong winds. View from Tee to Green on "Short"
The two tee shots below are safe as they found the correct tier, while another drive long and left will face a massively sloping downhill putt that could easily run down past the pin to the front level, or off the green. 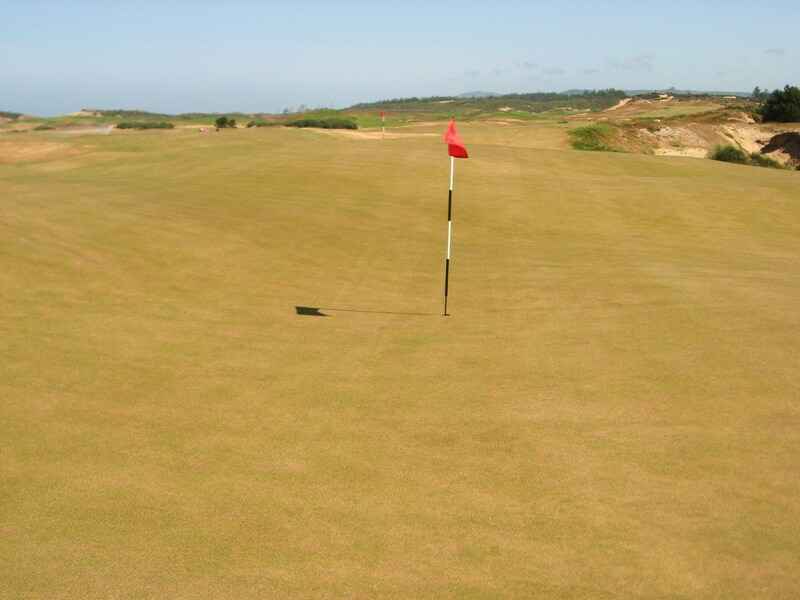 The “Short” green is actually a massive double which links up with the putting surface on the “Bottle” hole. 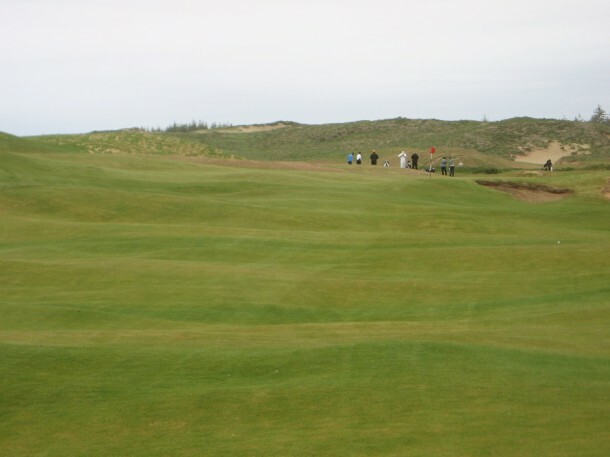 The grand undulating contours that can be found on many Old Macdonald greens are obvious in the picture below. The scale of Old Macdonald is overwhelming, in a very good way, for any golfer who is used to playing tree lined courses at home. 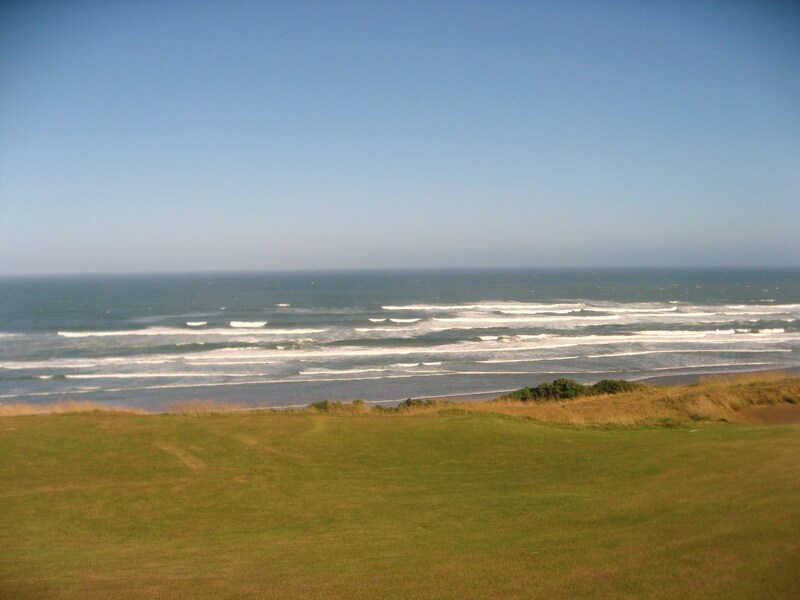 The view from the tee on “Long” will make any links golf junkie excited – a wide open vista with clumps of gorse, fescue, bunkers, ridges, mounds, and the ocean somewhere in the distance. View from Tees on "Long"
A well placed drive on the left side of the fairway leaves a view to the pin in the distance, but the right side is the safest option although it forces the golfer to face down Doak and Urbina’s rendition of the “Hell Bunker”, which is spectacular. The "Long" Fairway with the Hell Bunker in the distance. The “Hell Bunker” crosses the fairway about 120 yards from the center of the green. It is probably the most intimidating man made feature I have ever seen on a golf course. After a big drive, the golfer has a big decision to make on the second, as the bunker confuses lay up strategy because of its size. Downwind, the green is very reachable and the bunker should not come into play, but against the summer headwind it can bare its teeth. "Hell Bunker" from the Fairway on "Long"
Railroad ties have been implemented to keep the earth in place. 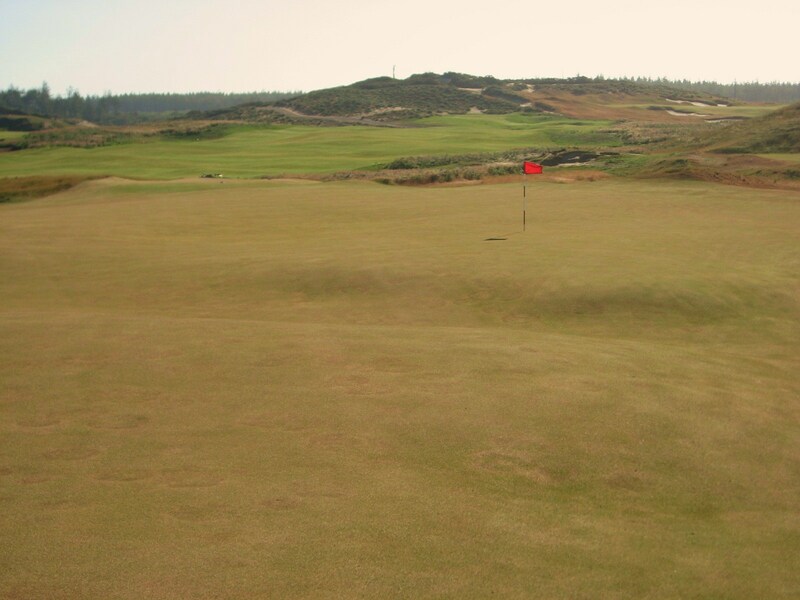 Once past the bunker, a green awaits that is a lot more undulating than meets the eye. From the tee, this looks like a short but challenging uphill slog to a green located up on a plateau. 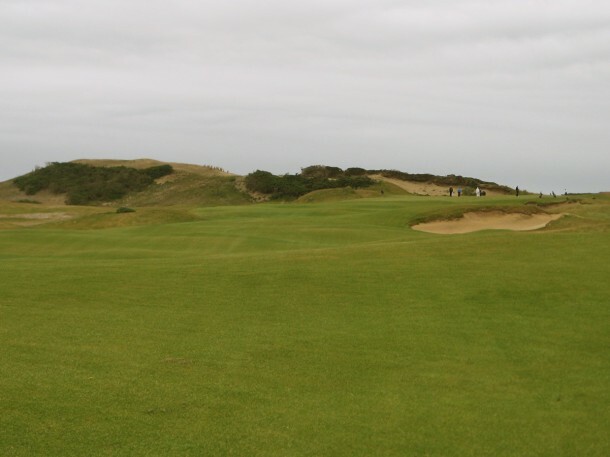 Into a 30 mph wind, the second hole plays a lot longer than its yardage, while it can play quite short with a helping wind from the south – making 3 wood and then putter from the fairway a decent play. The approach is blind from the bottom of the hill. At the top, an incredible view awaits, especially on a clear day. There is not a lot of room to miss long although there are bunkers that may catch an errant shot that rolls off the back. The green is expansive with sideboards on the left and right. The vista is one of the best on the entire property. 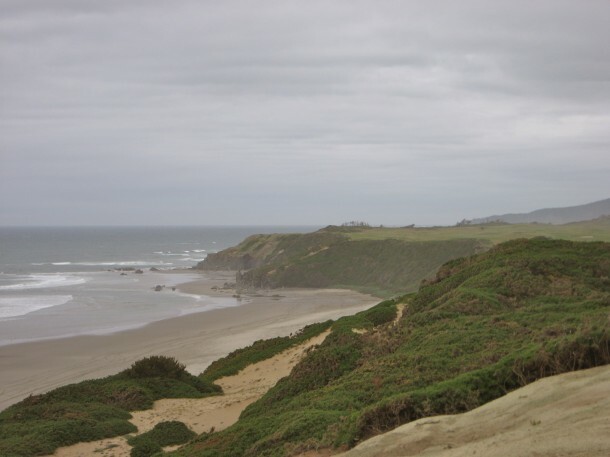 The “Snack Shack” at Old Macdonald has a panoramic view of the Pacific and provides a great angle to check out the Sheep Ranch to the north. 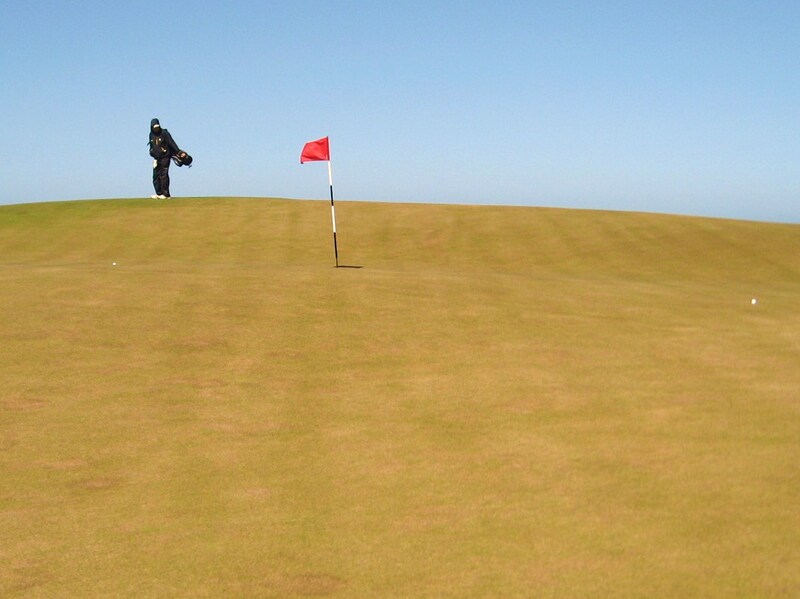 With a cross-wind whipping, the golfer is happy that the putting surface looks so big. Little do they know that a large swale located in the middle of the green will make a putt from the wrong section extremely difficult. 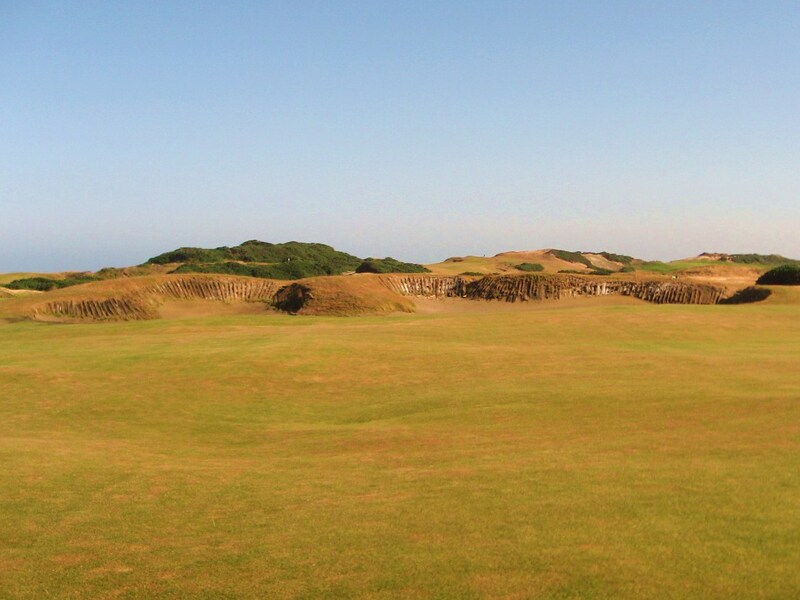 In true “Biarritz” fashion, the deep swale is complemented by bunkers that guard the green on the side and the back. 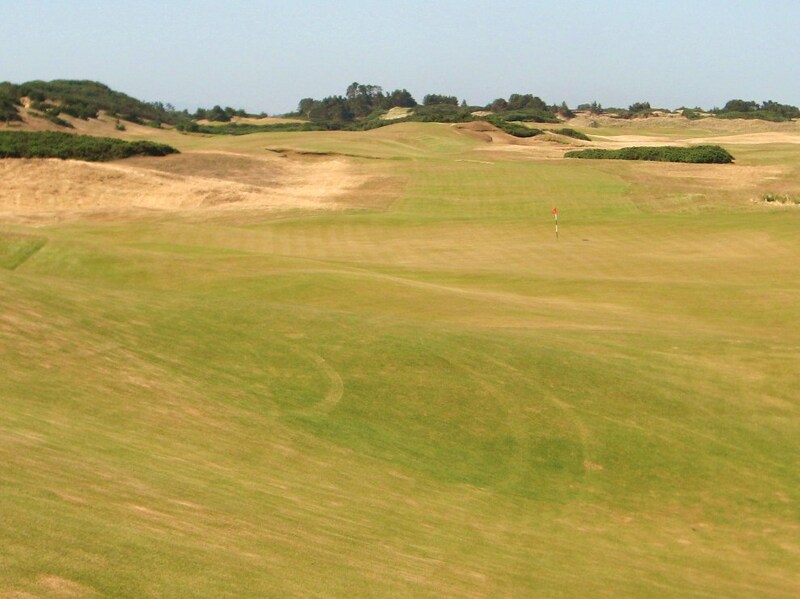 The trough in the middle of the green is amazing to behold for any golfer who has never seen a “Biarritz” before. 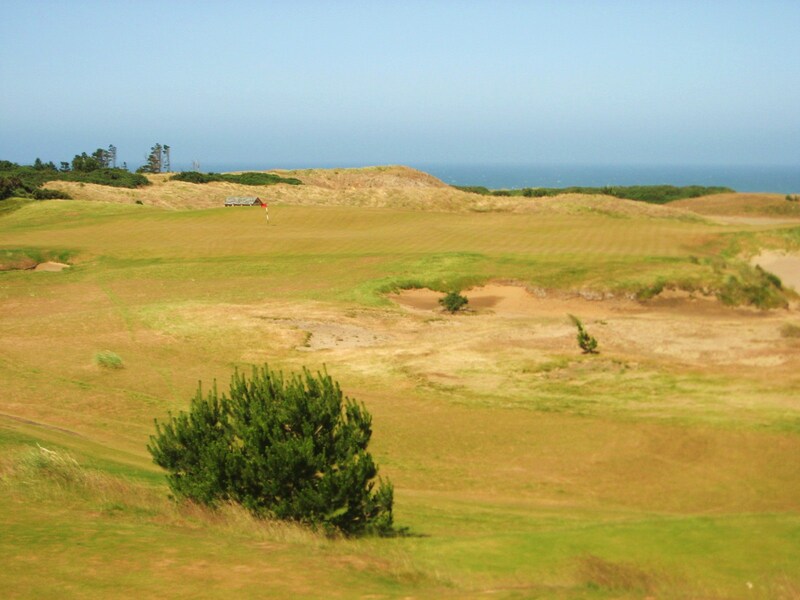 Doak and Urbina have done a fabulous job of integrating this template into the rugged environment along the Oregon coast by tweaking the shape of a “typical” Biarritz green to ensure that the swale looks quite natural. The tee shot caught in the valley has a big climb to get to the hole. Clearly, this is not an undulation but a deep scar in the green that is several feet below the other sections of the putting surface. 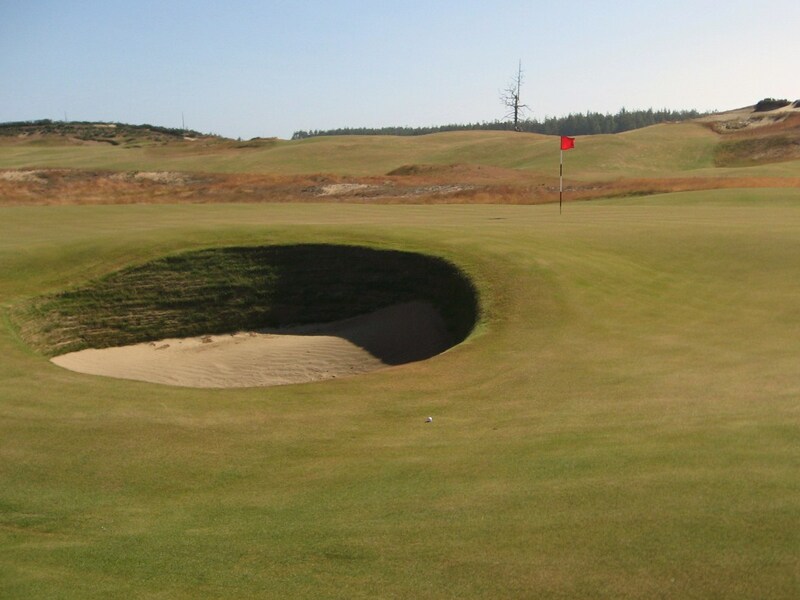 The “Cape” is a heroic hole that challenges the golfer to bite off as much land as he can on the drive. This inland version is much tamer than its predecessor at the Mid Ocean Club in Bermuda, but it is still a decent hole. 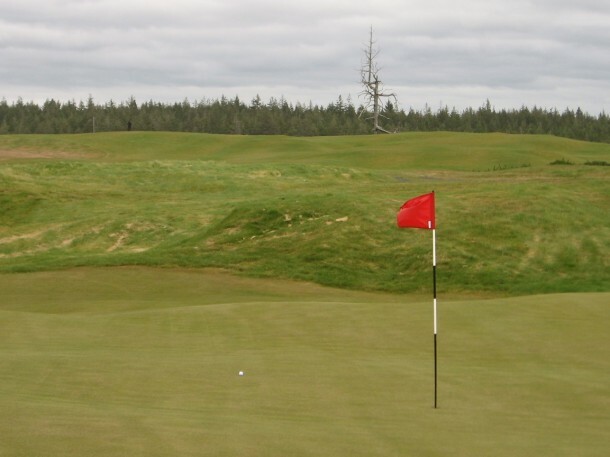 A safe play to the left will leave a mid to long iron approach, while a long drive that skips past the bunkers can leave a gap wedge into the green if you have a tailwind. 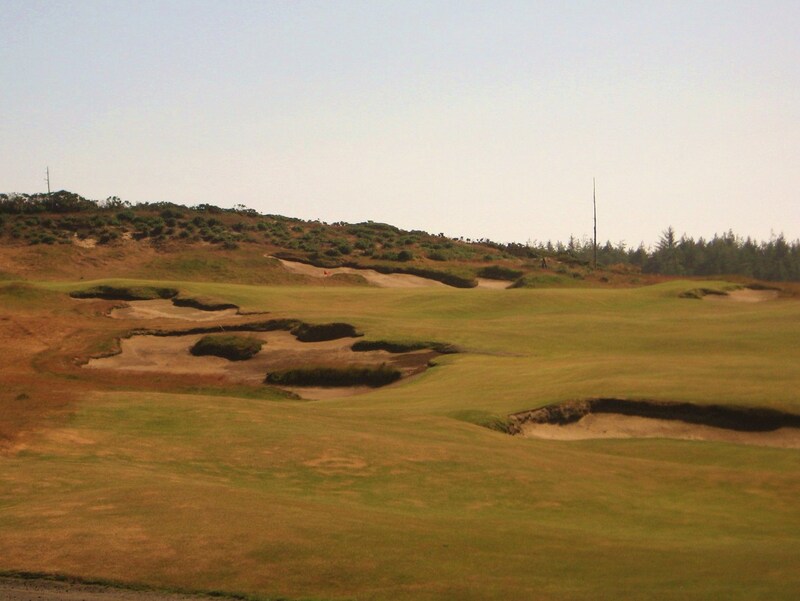 An errant drive may find one of these timeless fairway bunkers. You will not find a lot of fluffy sand on Old Macdonald. 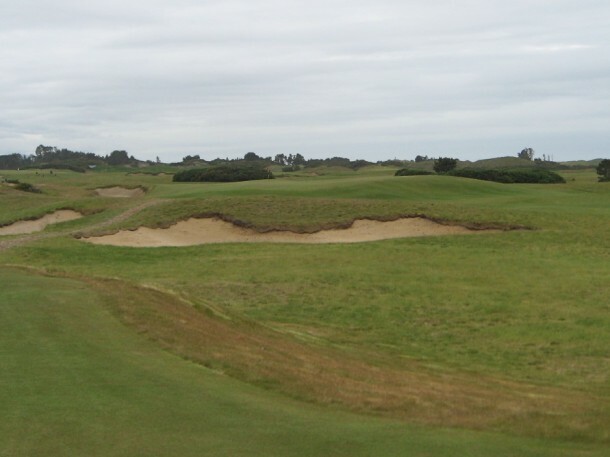 These large greenside bunkers wait patiently for an offline approach, although the contoured green can defend itself well enough on its own. Off the tee, the golfer encounters a series of bunkers that cross the fairway at longer intervals, beginning short-left and ending far-right. So you must be realistic about distance in order to choose the safe and appropriate line, always factoring in the wind. 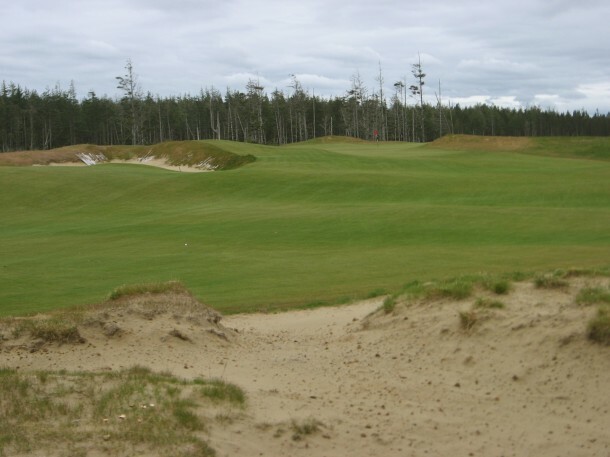 The approach is to a raised green that is protected on the front with a bunker. 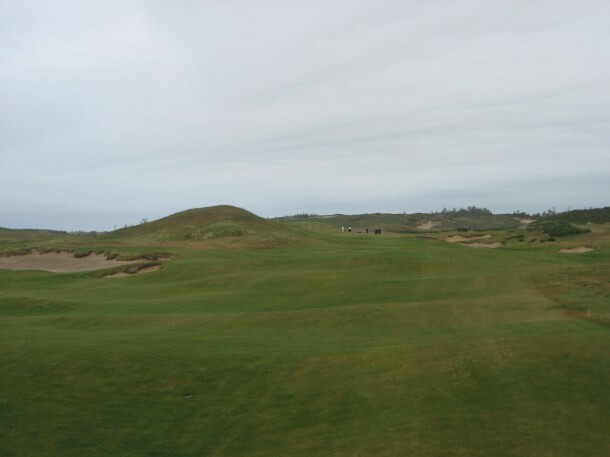 The shot below from wide right shows that the “Long” fairway is not such a bad line to come in on. Anything short will lead to the classic links conundrum of wedge versus putter . . . it is never easy to clip it off the short grass to a raised green. 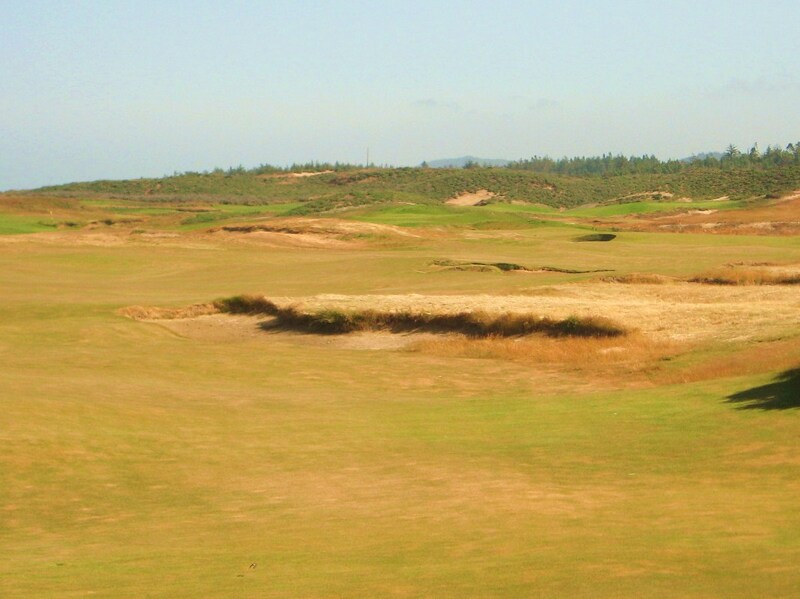 Short of Green on "Bottle"
Designed in the spirit of the most famous hole in golf, the “Road Hole” at Old Macdonald is a lot of fun. 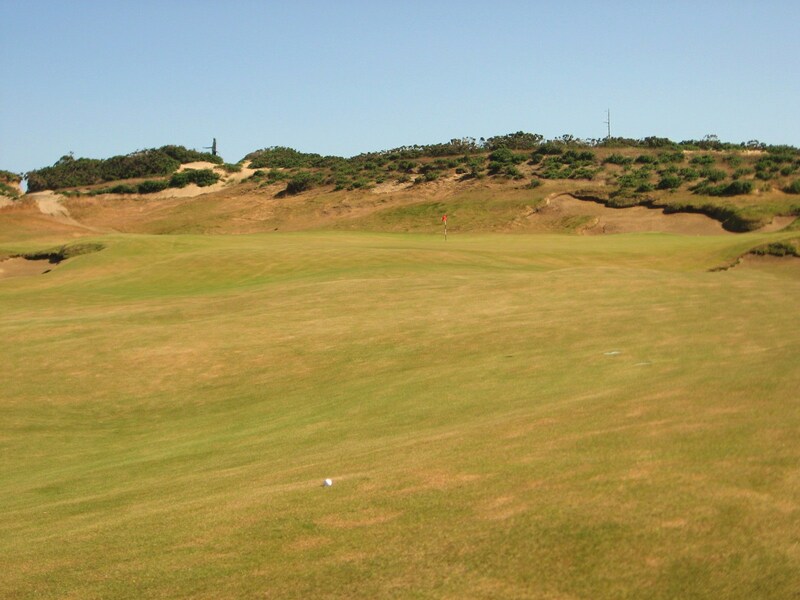 Into the wind, this hole plays pretty long so a drive too far left can turn it into a three shotter. The optimal line is over the edge of the long grass and safely onto the fairway. 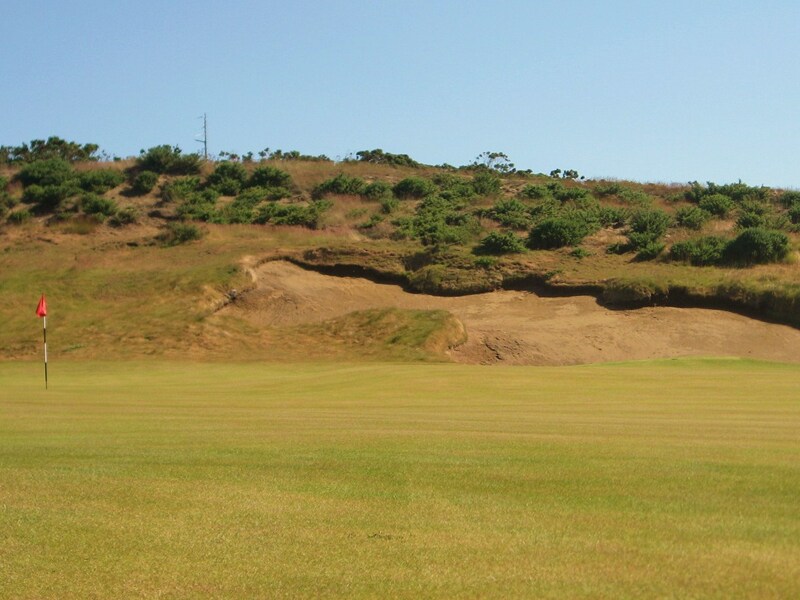 While the famous “Road Bunker” is visible from the tee, its presence is much more daunting on the approach as the size and depth become apparent. 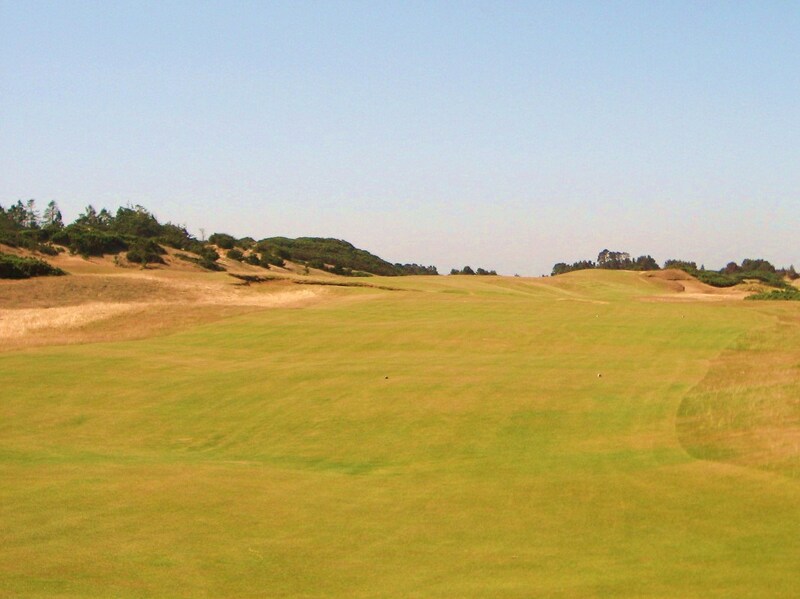 Try not to be distracted by the gorgeous natural blow out bunkers and dunes in the background. 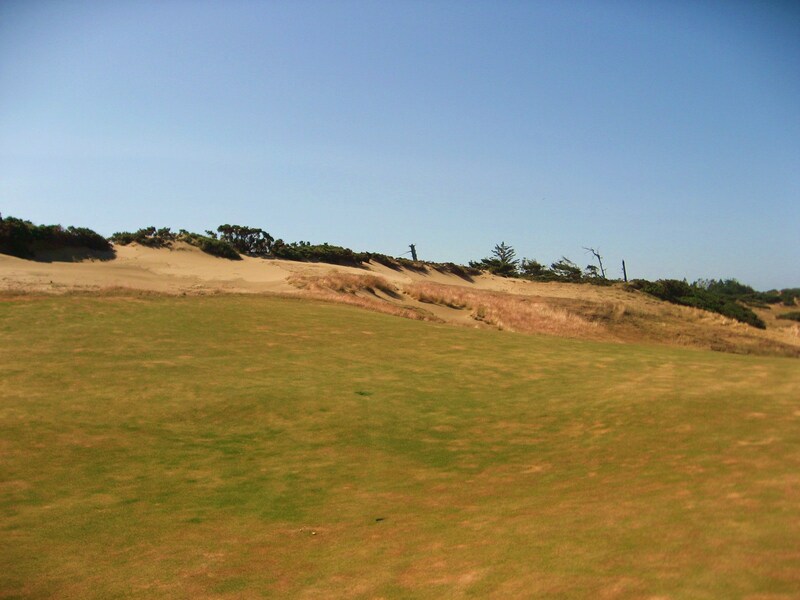 The softest sand on the course awaits the golfer in the bunker. Note how the strong wind has pushed the sand half way up the right side, while the flag whips in the background. There is no road or path along the back of the green, just a tightly mown collection area that leads to longer grass. The “Redan” on Old Mac is a devilish original. Into the wind it takes a low hooking iron or well struck fade. 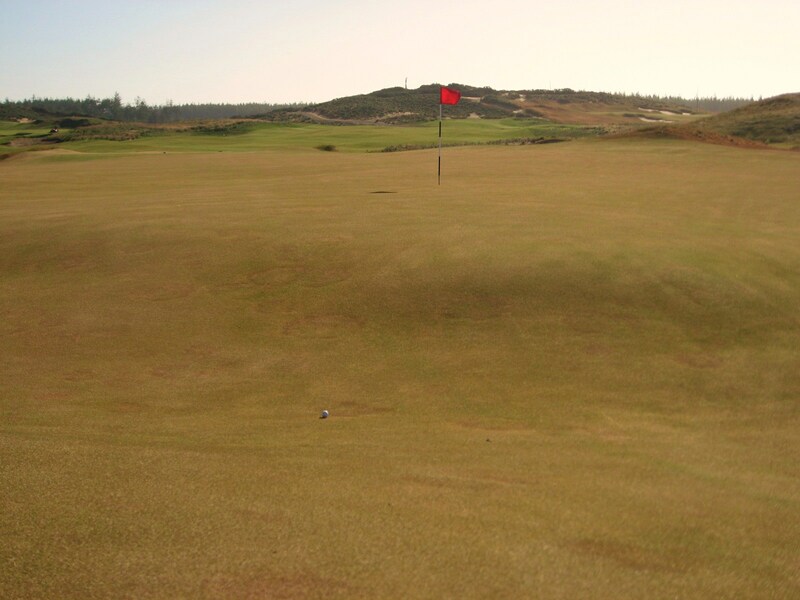 With the wind it seems to call for a low running shot that manages to run up the right side and stop on the putting surface. 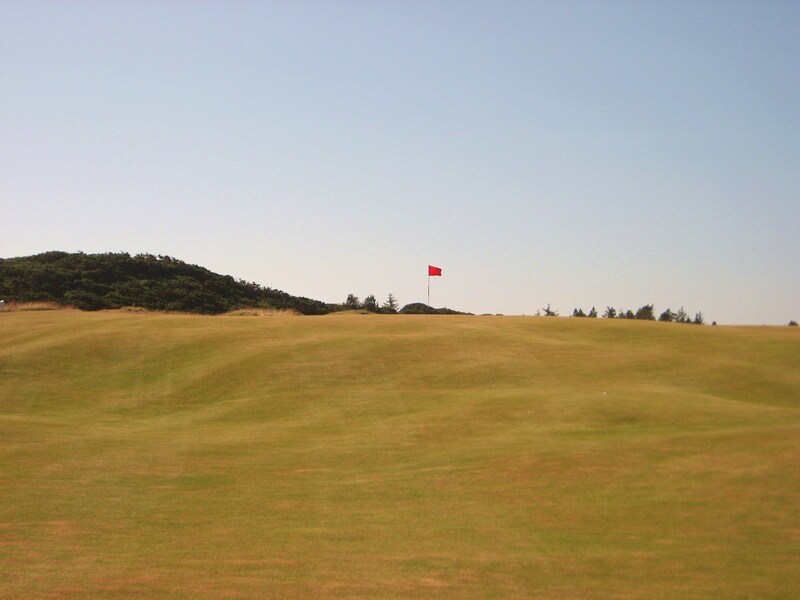 “Leven” is a really fun short par four with a tailwind that probably plays rather stout into a headwind. The fairway and green are made for the “putter approach” which is my favorite. The bunkers on the right are trouble but there is plenty of room on the left to run a shot in and down to the pin, even if it is tucked behind the bunkers. 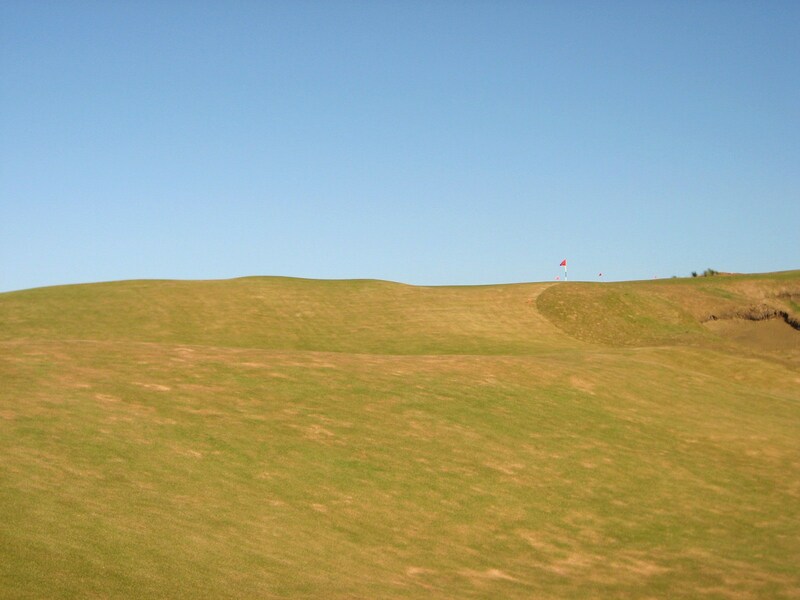 The ball below was played in across the undulations, up around the left side of the green and back down to the right. It was about 15 seconds of links golf nirvana watching the shot from start to finish. 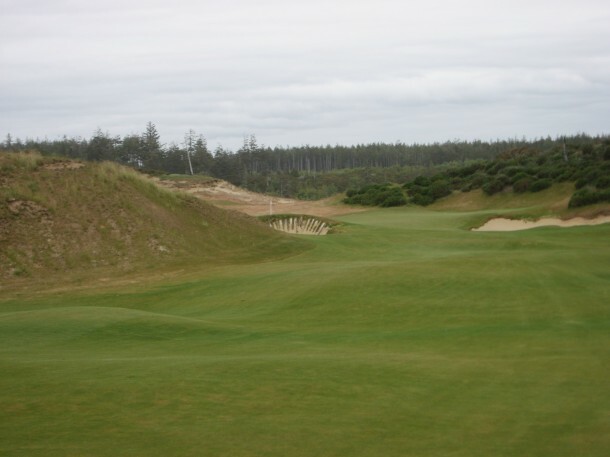 The seventh is a drivable uphill par four when the wind is helping, but probably not in a cross-wind. The hole has some “Cape” like qualities in that an attack on the green will require a long a precise carry over hazards. The right side of the fairway actually provides the best line into the green for a wedge approach. 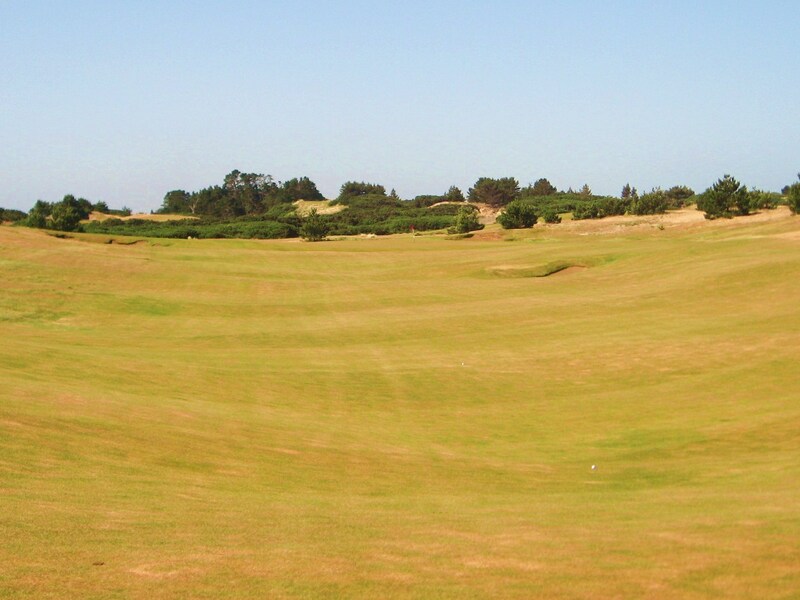 The fairway has a strong camber that starts high on the right side. Although the lie may not be flat, it is possible to get a wedge or putter close from here. 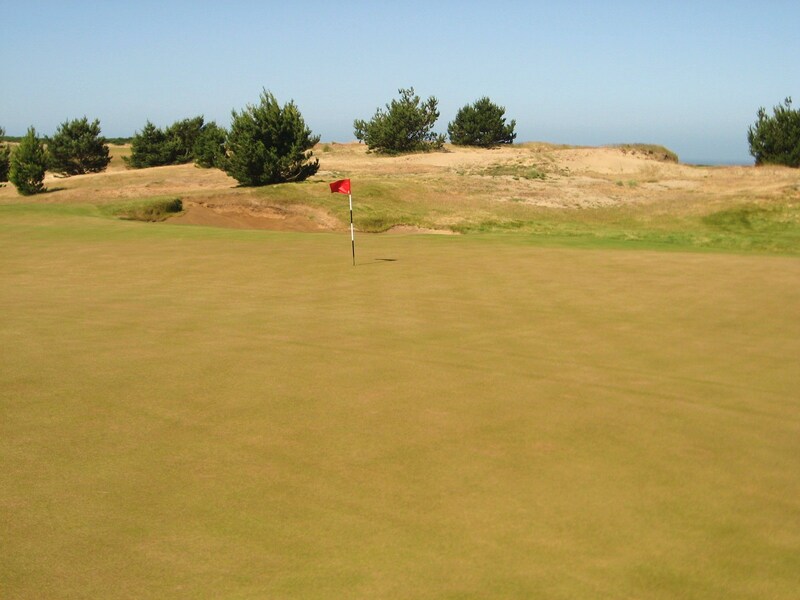 The green is large with sweeping undulations. A large bunker will gobble up anything long and leave a challenging “out” to a green that is running away with a sharp drop off the front. Green and back bunker on "Maiden"
The 15th is a stout three shotter that will usually play with a cross-wind. It plays from dune to dune across a valley. After negotiating the ball past a deep fore bunker, the golfer encounters a front to back sloping green with a gorgeous blow out bunker in the background. It is a good idea to say out of that one. Possibly the most fun hole on the course, Alps plays downhill back along Westward Ho. The green is hidden behind the “Alps” which is the huge mound in the distance pictured below. A drive on the left side of the fairway will leave a blind approach. There is a cavernous bunker behind the Alps on the right and a long slope on the left that will kick a ball down onto the green. A well struck drive down the right will provide a big advantage in a clear view to the green. A low running shot between the bunkers would be a great play from here. Looking back from the green it becomes evident that a left fairway drive off the tee actually leaves a fairly straightforward approach over the Alps which will run down to the green, provided it lands on the short grass and not in the bunkers on either side of the ramp. Looking back from green to "Alps"
The “all clear” bell behind the Alps green – a nice touch that lawyers will approve. The most fun three shotter on the course is reachable with a big drive up the right side over the “swamp” or waste area which is 250ish out. The left side is fairly open off the tee and a safe play. From behind the waste area the superior angle from the right side to the green is more evident. View from behind the "Littlestone Swamp"
The green is protected by a deep bunker on the front left while the right is open. At 64 yards long, club selection to the putting surface plays very differently day to day. “Punchbowl” has one of the most FUN greens I have ever seen. A rather inviting fairway welcomes the final drive of the day. The huge bowl shaped green is protected on the front by several large mounds that block access. 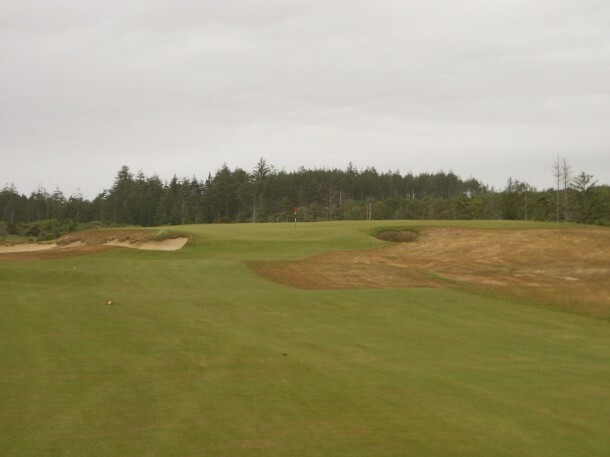 The green has four separate shelves and plays 46 yards deep. A running approach is always the play if possible – if only to watch the ball react to the contours. “Punchbowl” provides a fabulous end to the round. Fortunately, the first tee beckons loudly only about 50 yards away. 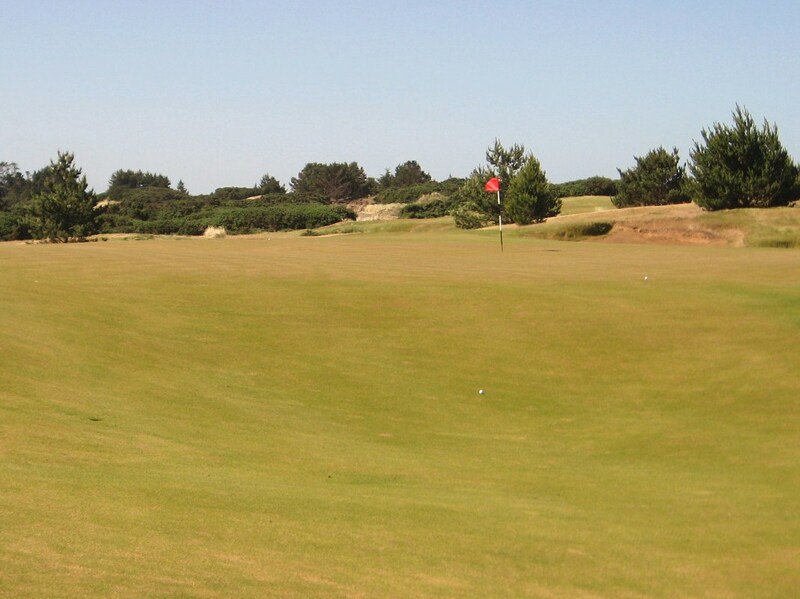 The passionate walking golfer will want to re-tee it immediately as there are few golfing journeys as enjoyable as Old Macdonald. 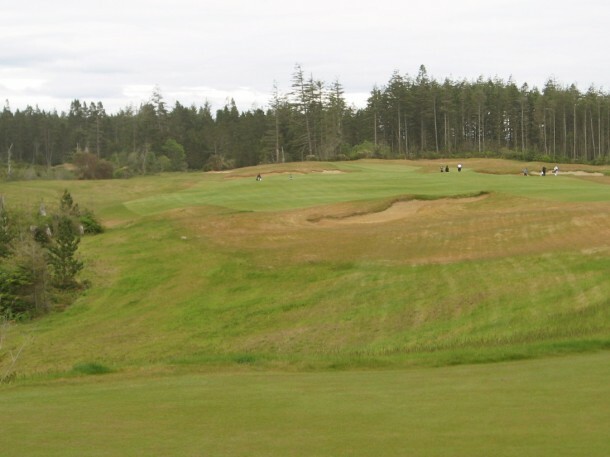 Old Macdonald will probably become a favorite of many visitors to the resort, which says a great deal about the course because it only touches the ocean a couple of times, unlike Bandon Dunes and Pacific Dunes which have several epic stretches along the bluffs. 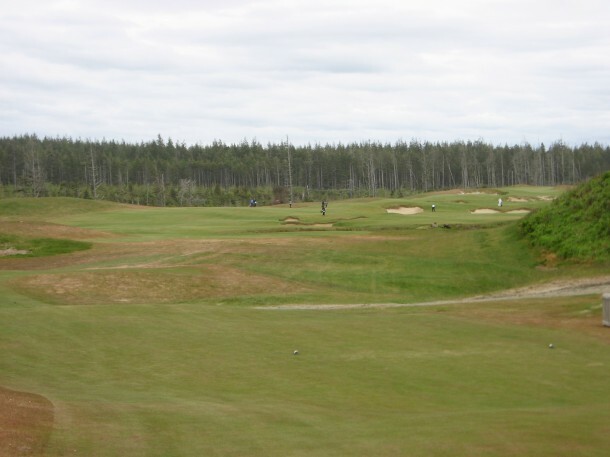 The scale of Old Macdonald is much bigger than any of the other courses because of the open vistas and elevation changes around the edges. 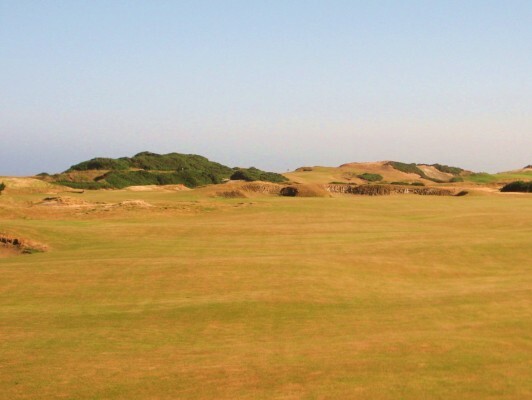 Pacific Dunes is an incredible course with exquisite attention to detail and a superior routing, but Old Macdonald MAY have something that it is missing in its obvious and powerful tie to the links courses of Scotland that C.B. Macdonald used as a foundation for NGLA, his masterpiece. OM and PD are very different, each compelling in its own way. Old Macdonald is very walkable, a 3.25 out of 4 IMO. The climb over the dune on “Sahara” is a little steep, the “Ocean” hole has another steep climb, and there are other steady climbs on Maiden and Westward Ho. The 4th through the 6th and 9th through 13th play across a rather flat valley and then 17 and 18 are on the same fairly level stretch as 1 and 2. I would consider Old Macdonald a pretty “easy walk”. In terms of Architecture, the team at Renaissance have once again done an incredible job with a compelling piece of land. Macdonald’s templates have not been copied, but used for inspiration and taken to another level by Doak, Urbina and team. Old Macdonald appears as if it has been there for many, many, years which is a testament to its creators and the skills of the Super Ken Nice and his staff. 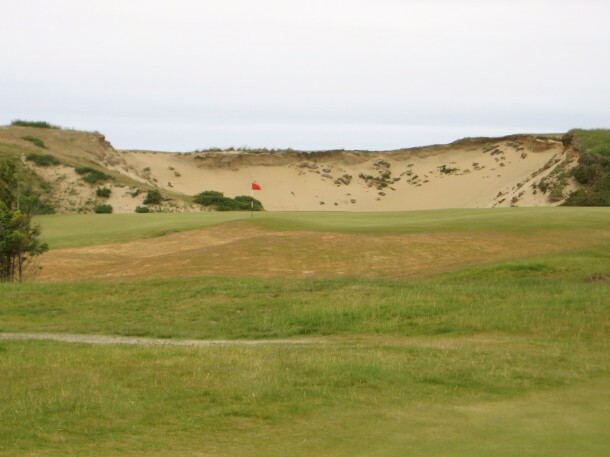 Aesthetically, Old Macdonald competes with the tree lined landscape of Trails on 1,2, 17 and 18, along with both of the Dunes courses which boast a series of ocean holes. 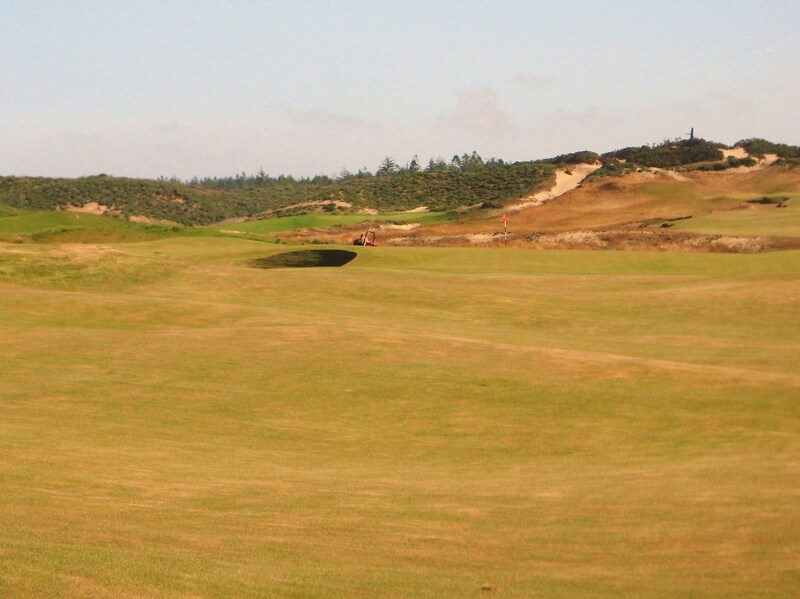 The blowouts on and around Old Macdonald are like nothing on the property aside from the 13th at Pacific. 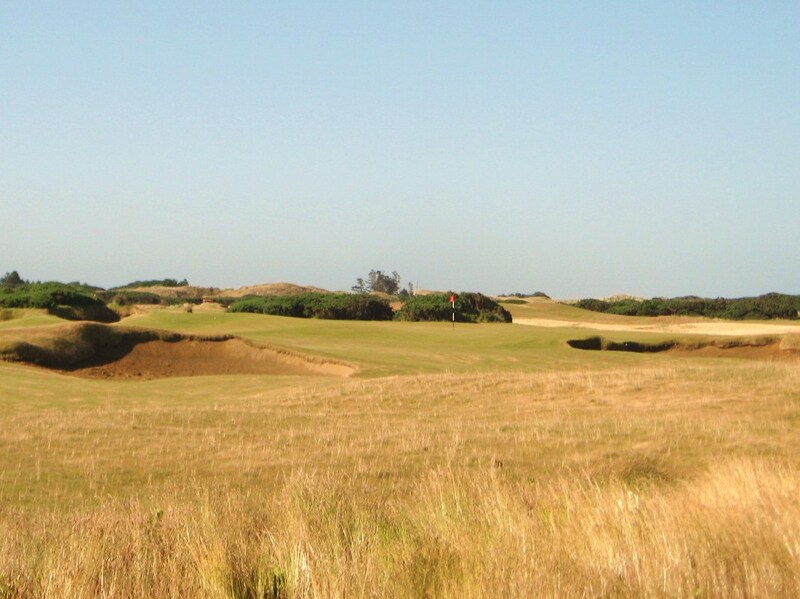 The rugged and beautiful nature of the property is spectacular and the old world links golf flavor of the course must be seen to be believed. Old Macdonald receives 3.75 out of 4 for Architecture and Aesthetics. 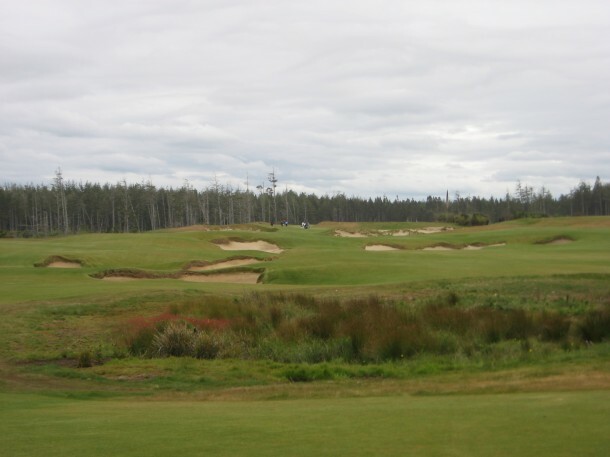 Strategy is important for scoring at Old Macdonald, but like St.Andrews, the course is incredibly playable for all levels of golfer due to the wide fairways, a 2 out of 2. 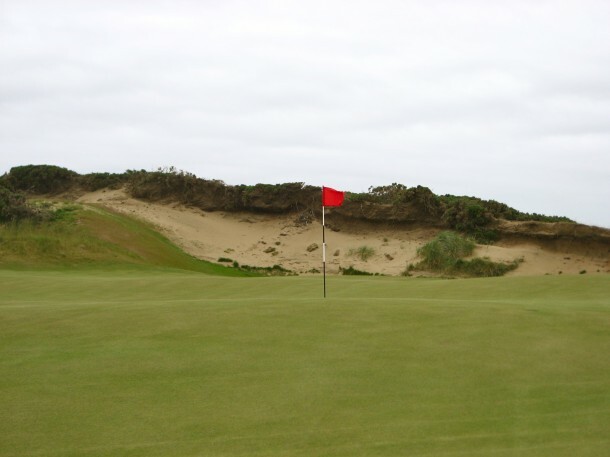 The greens are very big and tricky at first because of a mix of large and subtle undulations, but they are definitely a fair challenge. Smart play and a good strategy can result in excellent scoring, so stay focused and enjoy this “all world” golfing experience. Sublime. Thanks for the review. I just played Old Mac yesterday (6/30/10) and the day prior. An amazing course added to a collection unmatched anywhere. Great review. Just played Old Mac (7/10) — caddie said wind was about 5 on a 10 scale, and it was steady 20-25 mph, with higher gusts. If you like golf architecture, and appreciate golf strategy, you’ll love this course. my hat to both his vision and the talented hands he turned this land over to. just 13 more days. 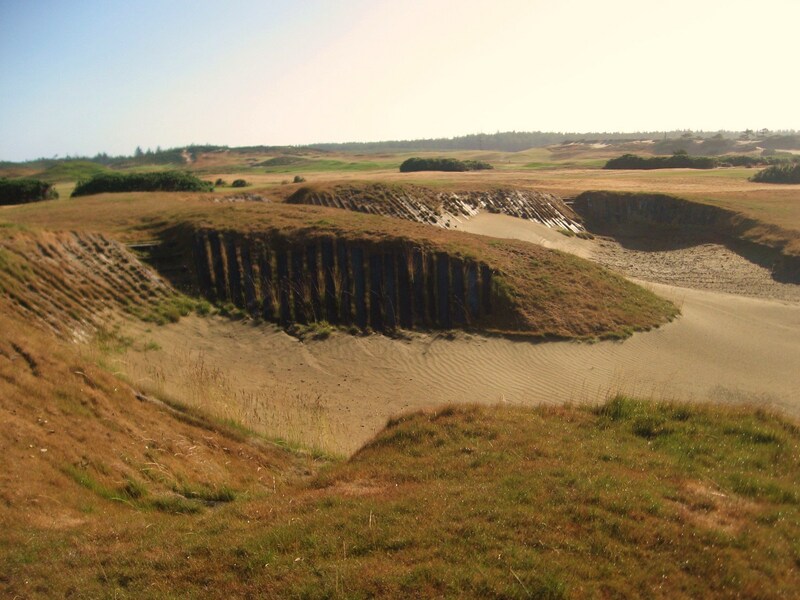 Just when I thought I had seen all that the Bandon Dunes golf resort had to offer… I was completely awestruck at the asthetics at Old Mac as well as the playability. 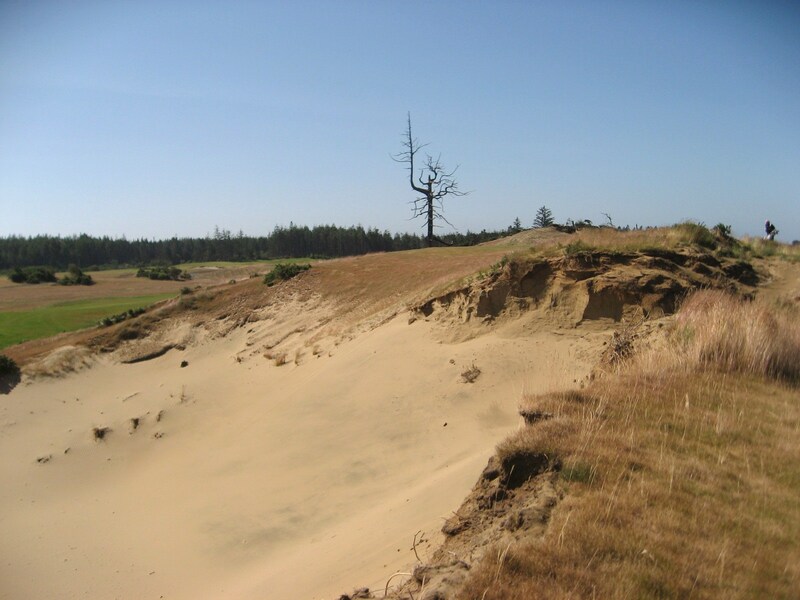 Although it may not be as hard as Pacific with the wind gusting at 30 MPH like it was for me the last two days, I can easily see how this golf course can be the most challenging of the four that Bandon Dunes has to offer. The rolling fairways were great and the greens looked almost as though they had buried beached whales within the greens. 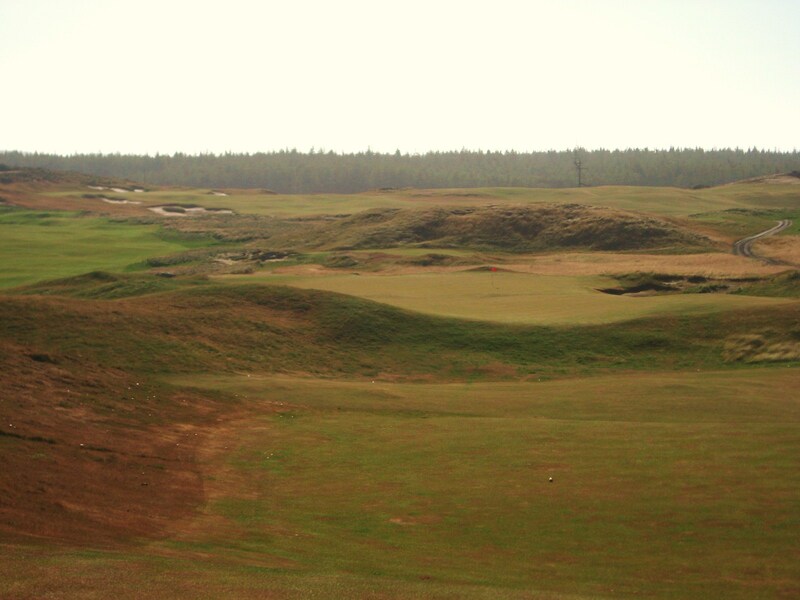 This is by far my favorite of the four golf courses at Bandon and look forward to playing it again. 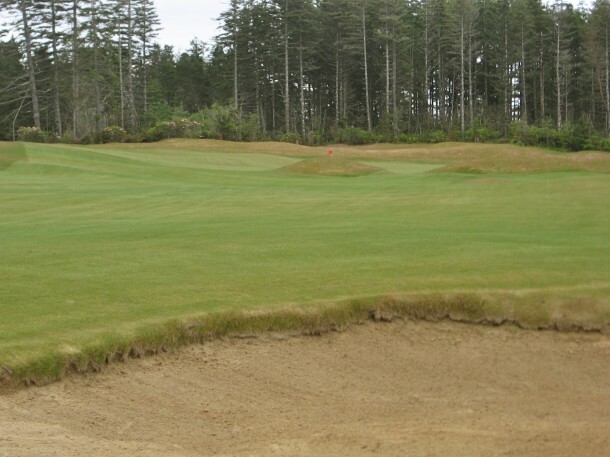 I made my first trip to Bandons Dunes resort last November. The plan was to play all 4 courses in 4 days, with Old Mac being first on in the rotation. All I can say is Old Mac is an incredible Golf experience. The view you are about to see when you get to the crest of the 3rd fairway is simply awe inspiring. You look out over the valley and see this VAST linksland and you just say “wow”. The next great moment is when you get to the green on #7. All of a sudden, you reach the green at the crest of the hill and the ocean just jumps right out at you. You get an adrenalin rush when you see it! The course is super playable and forgiving when playing the correct angles, but punishing when you attack deadon, and miss. You will hit every club in the bag, and hit shots you never hit at your home course. It’s a course that you love to day dream about; especially if you just played it and are laying in bed thinking about your round. It’s my favorite course now! SO fun to play! In a nutshell, the whole property is like a dreamland for Golfers. You can’t believe this place exists out in the middle of Tim Buck too. But it does, and it’s there and real.